Minecraft is so much more than a game; it’s a cultural phenomenon all by itself! Started by “Notch” AKA Markus Persson in 2011, the 3D block-building game has gone on to sell over 150 million copies as of 2018. This makes it the #2 best-selling game of all time, beaten only by Tetris (hmmm, another game about blocks). For those of us (like Present Author) that were around for the earliest releases, words cannot express what a cultish experience it was. Players would explore the game and post screenshots and videos of unusual sights in the game’s world. Notch was engaged in the online community, his impish smile gracing Twitter tweets announcing new expansions and updates to the game. He’d drop in to announce new features, like boats, minecart trains, or mobile snowmen, and the community would dive into the game to play with the new toy. A little explanation for the game: Minecraft is a 3D world that’s an open-ended sandbox – some estimate that each Minecraft map is 8x the surface area of Earth. The world is composed of a natural world with some primitive settlements, leading to a huge array of features that roll on past each new horizon – mountains, rivers, planes, snowy tundra, desert, flower fields, villages, temples, pyramids, caves, caverns, pine forests, savanna, and so much more. You can move anything. You can collect resources and use them to craft new stuff. You can build – Lord, can you ever build! Cathedrals, roller coasters, factories, skyscrapers, and a primitive form of wiring and circuitry even lets you build computer-like devices. If you can dream it, you can build it in Minecraft. The only catch is the world is also populated by a fantastic menagerie of hostile critters. These start with the mundane spiders and skeleton archers, extending to Minecraft-specific creatures like the iconic Creeper, a walking green nightmare who is silent and only announces its presence by sneaking up behind you and exploding! Being made of blocks, Minecraft is a great fit for Lego, and the demands for Minecraft-themed Lego sets started almost as soon as the game was launched. Here we present the most impressive Minecraft-themed Lego sets, recreating some of the most exciting scenes you’re likely to encounter in the game. 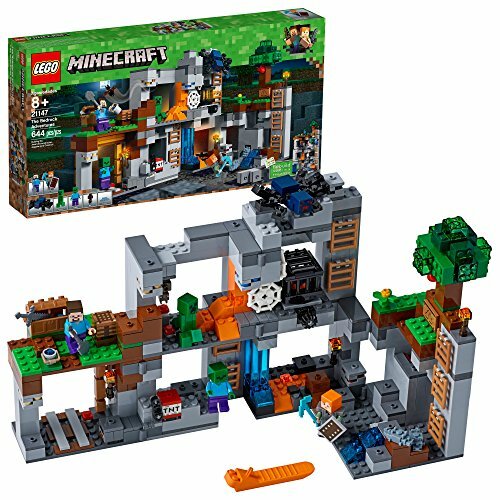 The unique aspect of Lego Minecraft sets is there’s no one way to assemble them; you get a manual with sample suggestions of how to build the set, but really the point is to encourage creativity in the spirit of the game. 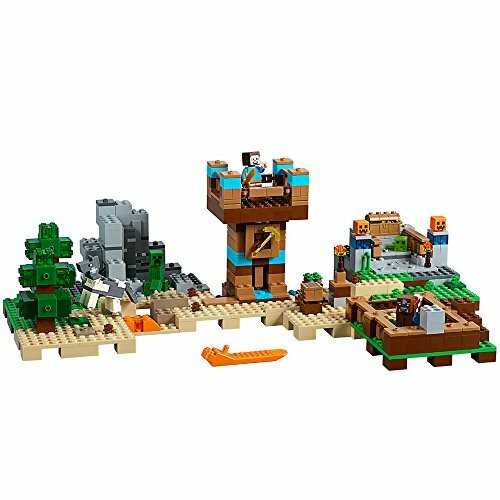 This set is the perfect starting point – remember your first base that wasn’t just a mud hut? You get a full set-up for a starter base, with several figures, creatures, and props from the game. At 717 pieces, it’s an open-ended set that will stimulate your creative juices. Every Minecraft player remembers their first trip into the Nether. You can’t just blunder into it; you have to build a portal out of obsidian blocks and ignite it. Once through, you discover the Nether is a disorienting hellish underworld of fire, lava, huge open spaces, and new hostile enemies. It’s about then that the nightmarish Ghast utters its chilling cry and fireballs you to a crisp. Lesson one of exploring the Nether: Don’t stand still! 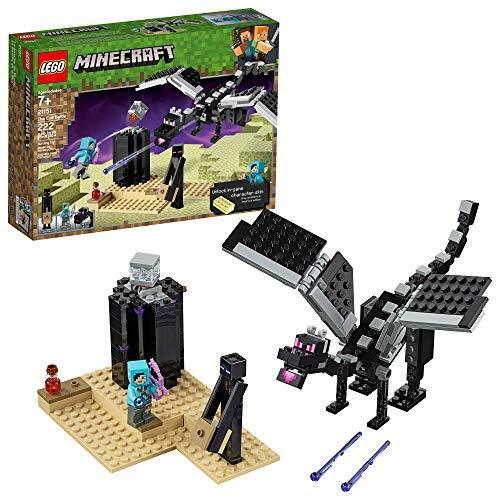 At 644 pieces, this makes a decent stand-alone set but also a perfect add-on set to the basic Crafting Box set (see above). Cave spelunking is an integral activity in Minecraft. 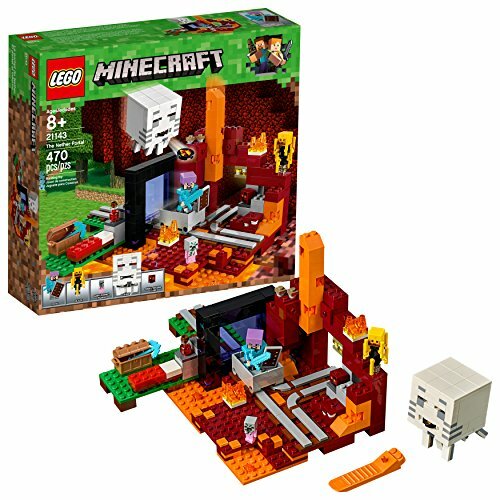 This set comes with a zombie figure, because every Minecraft player knows the chill of encountering a mob of growling zombies sneaking up behind them in the darkness while they were too distracted mining out a diamond vein. Build and venture to the End dimension, complete with a ferocious fireball-shooting ender dragon, enderman and a dragon slayer, plus an obsidian pillar and an end crystal with pop-up functionality! Also includes a code for redeeming a dragon slayer skin in the Minecraft Bedrock Edition online game! Thanks to Minecraft’s non-linear nature, most players never even check into The End. It’s another special biome that requires a series of non-intuitive steps to access. The purpose of The End is just to give you a big dragon to fight to “win” the game for those who must have an ending. But really, Minecraft is life; choose your own adventure and define your own win! Build a pirate ship toy with working flick-missile cannons, gold detailing, pirate banner, gangplank and rowboat, plus a host of Minecraft mobs-all in a LEGO Minecraft skull island setting! Yar me mateys! Pirates were a later addition to the Minecraft universe, but you have to admit they fit right in. Like the game itself, pirates suggest high adventure and exploration, danger and a treasure reward. 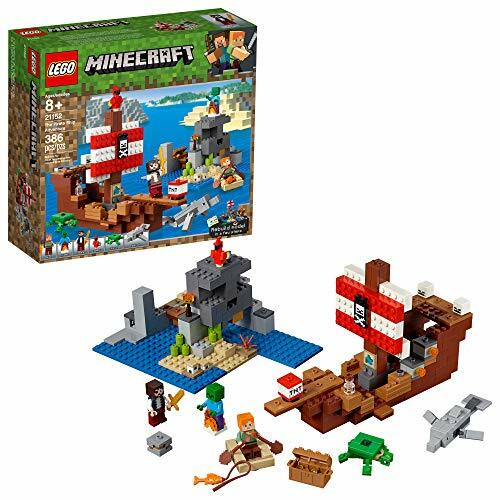 This 386-piece set gives you a high seas menagerie with two scurvy sea-dog figures, a zombie, a turtle, a dolphin, a ship, an island, treasure chest and more. An inspiring addition to your Minecraft Lego scenes. Marvel at this beauty, and all you can say is “wow!” A staggering 2,863 piece colossus, this set keeps on giving. A minecart train, redstone elevator, shelter and furnishings, a spider spawner, and a completely landscaped mountain. The figures include Steve and Alex, slimes, Endermen, a creeper, a skeleton, bats, and more. A rounded host of accessories and props plus play features make this a set that will keep you busy for a while. 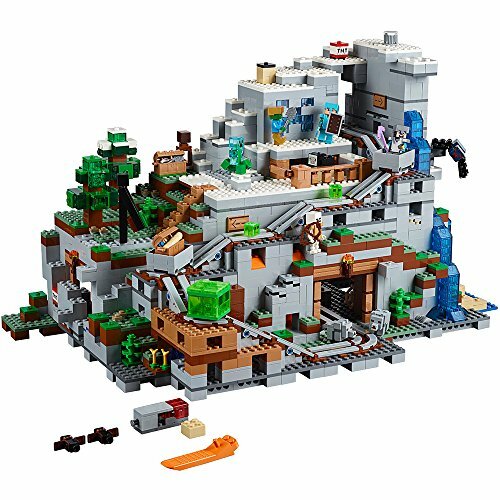 It may be at the top-end, but if you get only one Minecraft Lego set, this is the one to pick!